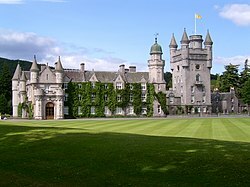 Balmoral Castle (/bælˈmɒrəl/) is a large estate house in Royal Deeside, Aberdeenshire, Scotland, near the village of Crathie, 6.2 miles (10 km) west of Ballater and 6.8 miles (11 km) east of Braemar. Balmoral has been one of the residences of the British royal family since 1852, when the estate and its original castle were purchased privately by Prince Albert, the husband of Queen Victoria. It remains the private property of the royal family and is not part of the Crown Estate. The castle is an example of Scottish baronial architecture, and is classified by Historic Environment Scotland as a category A listed building. The new castle was completed in 1856 and the old castle demolished shortly thereafter. King Robert II of Scotland (1316–1390) had a hunting lodge in the area. Historical records also indicate that a house at Balmoral was built by Sir William Drummond in 1390. The estate is recorded in 1451 as "Bouchmorale", and later was tenanted by Alexander Gordon, second son of the 1st Earl of Huntly. A tower house was built on the estate by the Gordons. In 1662, the estate passed to Charles Farquharson of Inverey, brother of John Farquharson, the "Black Colonel". The Farquharsons were Jacobite sympathisers, and James Farquharson of Balmoral was involved in both the 1715 and 1745 rebellions. He was wounded at the Battle of Falkirk in 1746. The Farquharson estates were forfeit, and passed to the Farquharsons of Auchendryne. In 1798, James Duff, 2nd Earl Fife, acquired Balmoral and leased the castle. Sir Robert Gordon, a younger brother of the 4th Earl of Aberdeen, acquired the lease in 1830. He made major alterations to the original castle at Balmoral, including baronial-style extensions that were designed by John Smith of Aberdeen. 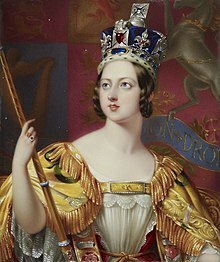 Queen Victoria and Prince Albert first visited Scotland in 1842, five years after her accession to the throne and two years after their marriage. During this first visit they stayed at Edinburgh, and at Taymouth Castle in Perthshire, the home of the Marquess of Breadalbane. They returned in 1844 to stay at Blair Castle and, in 1847, when they rented Ardverikie by Loch Laggan. During the latter trip they encountered weather that was extremely rainy, which led Sir James Clark, the queen's doctor, to recommend Deeside instead, for its more healthy climate. Quickly, the house was confirmed to be too small and, in 1848, John and William Smith were commissioned to design new offices, cottages, and other ancillary buildings. Improvements to the woodlands, gardens, and estate buildings also were being made, with the assistance of the landscape gardener, James Beattie, and possibly by the painter, James Giles. Major additions to the old house were considered in 1849, but by then negotiations were under way to purchase the estate from the trustees of the deceased Earl Fife. After seeing a corrugated iron cottage at the Great Exhibition of 1851, Prince Albert ordered a pre-fabricated iron building for Balmoral from E. T. Bellhouse & Co., to serve as a temporary ballroom and dining room. It was in use by 1 October 1851, and would serve as a ballroom until 1856. The sale was completed in June 1852, the price being £32,000, and Prince Albert formally took possession that autumn. :8 The neighbouring estate of Birkhall was bought at the same time, and the lease on Abergeldie Castle secured as well. To mark the occasion, the Purchase Cairn was erected in the hills overlooking the castle, the first of many. The growing family of Victoria and Albert, the need for additional staff, and the quarters required for visiting friends and official visitors such as cabinet members, however, meant that extension of the existing structure would not be sufficient and that a larger house needed to be built. In early 1852, this was commissioned from William Smith. The son of John Smith (who designed the 1830 alterations of the original castle), William Smith was city architect of Aberdeen from 1852. On learning of the commission, William Burn sought an interview with the prince, apparently to complain that Smith previously had plagiarised his work, however, Burn was unsuccessful in depriving Smith of the appointment. William Smith's designs were amended by Prince Albert, who took a close interest in details such as turrets and windows. Balmoral Castle is built from granite quarried at Invergelder on the estate, It consists of two main blocks, each arranged around a courtyard. The southwestern block contains the main rooms, while the northeastern contains the service wings. At the southeast is an 80-foot (24 m) tall clock tower topped with turrets, one of which has a balustrade similar to a feature at Castle Fraser. Being similar in style to the demolished castle of the 1830s, the architecture of the new house is considered to be somewhat dated for its time when contrasted with the richer forms of Scots Baronial being developed by William Burn and others during the 1850s. As an exercise in Scots Baronial, it sometimes is described as being too ordered, pedantic, and even, Germanic—as a consequence of Prince Albert's influence on the design. The purchase of a Scottish estate by Victoria and Albert and their adoption of a Scottish architectural style, however, was very influential for the ongoing revival of Highland culture. They decorated Balmoral with tartans and attended highland games at Braemar. Queen Victoria expressed an affinity for Scotland, even professing herself to be a Jacobite. Added to the work of Sir Walter Scott, this became a major factor in promoting the adoption of Highland culture by Lowland Scots. Historian Michael Lynch comments that "the Scottishness of Balmoral helped to give the monarchy a truly British dimension for the first time". Even before the completion of the new house, the pattern of the life of the royal couple in the Highlands was soon established. Victoria took long walks of up to four hours daily and Albert spent many days hunting deer and game. In 1849, diarist Charles Greville described their life at Balmoral as resembling that of gentry rather than royalty. Victoria began a policy of commissioning artists to record Balmoral, its surroundings, and its staff. Over the years, numerous painters were employed at Balmoral, including Edwin and Charles Landseer, Carl Haag, William Wyld, and William Henry Fisk. The royal couple took great interest in their staff. They established a lending library. In 1887, Balmoral Castle was the birthplace of Victoria Eugenie, a granddaughter of Queen Victoria. She was born to Princess Beatrice, the fifth daughter of Victoria and Albert. Victoria Eugenie would become the queen of Spain. In September 1896, Victoria welcomed Emperor Nicholas II of Russia and Empress Alexandra to Balmoral. Four years later Victoria made her last visit to the estate, three months before her death on 22 January 1901. After Victoria's death, the royal family continued to use Balmoral during annual autumn visits. George V had substantial improvements made during the 1910s and 1920s, including formal gardens to the south of the castle. Since the 1950s, Prince Philip has added herbaceous borders and a water garden. During the 1980s new staff buildings were built close to the castle. The "battlemented" porte cochère. Also called a "carriage porch", this structure is covered to protect guests from inclement weather. Though called a castle, Balmoral's primary function is that of a country house. It is a "typical and rather ordinary" country house from the Victorian period. The tower and "pepper pot turrets" are characteristic features of the residence's Scottish Baronial style. The seven-storey tower is an architectural feature borrowed from medieval defensive tower houses. The "pepper pot" turrets were influenced by the style of 16th-century French châteaux. Other features of the Scottish Baronial style are the crow-stepped gables, dormer windows, and battlemented porte-cochère. Balmoral is a private property and, unlike the monarch's official residences, is not the property of the Crown. It originally was purchased personally by Prince Albert, rather than the queen, meaning that no revenues from the estate go to Parliament or to the public purse, as would otherwise be the case for property owned outright by the monarch in accord with the Civil List Act 1760. Along with Sandringham House in Norfolk, ownership of Balmoral was inherited by Edward VIII on his accession in 1936. When he abdicated later the same year, however, he retained ownership of them. A financial settlement was devised, under which Balmoral and Sandringham were purchased by Edward's brother and successor to the Crown, George VI. Currently, the estate is still owned outright by the monarch, but, by Trustees under Deeds of Nomination and Appointment, it is managed by a trust. Balmoral Estate is within the Cairngorms National Park and is partly within the Deeside and Lochnagar National Scenic Area. The 50,000-acre (20,000 ha) estate contains a wide variety of landscapes, from the Dee river valley to open mountains. There are seven Munros (hills in Scotland over 3,000 feet (910 m)) within the estate, the highest being Lochnagar at 3,789 feet (1,155 m). This mountain was the setting for a children's story, The Old Man of Lochnagar, told originally by Prince Charles to his younger brothers, Andrew and Edward. The story was published in 1980, with royalties accruing to The Prince's Trust. :35–51 The estate also incorporates the 7,500-acre Delnadamph Lodge estate, bought by Elizabeth II in 1978. The estate extends to Loch Muick in the southeast where an old boat house and the Royal Bothy (hunting lodge) now named Glas-allt-Shiel, built by Victoria, are located. The areas of Lochnagar and Ballochbuie were designated in 1998 by the Secretary of State for Scotland as Special Protection Areas (SPA) under the European Union (EU) Birds Directive. Bird species inhabiting the moorlands include red grouse, black grouse, ptarmigan, and the capercaillie. :38 Ballochbuie also is protected as a Special Area of Conservation by the EU Habitats Directive, as "one of the largest remaining continuous areas of native Caledonian Forest". In addition, there are four sites of special scientific interest on the estate. The royal family employs approximately 50 full-time and 50–100 part-time staff to maintain the working estate. A malt whisky distillery located on the Balmoral Estate produces the Royal Lochnagar Single Malt whisky. There are approximately 150 buildings on the estate,:35 including Birkhall, formerly home to Queen Elizabeth The Queen Mother, and used now by Prince Charles and the Duchess of Cornwall for their summer holidays. Craigowan Lodge is used regularly by the family and friends of the royal family and also has been used while Balmoral Castle was being prepared for a royal visit. Six smaller buildings on the estate are let as holiday cottages. In 1931, the castle gardens were opened to the public for the first time and they now are open daily between April and the end of July, after which Queen Elizabeth II arrives for her annual stay. The ballroom is the only room in the castle that may be viewed by the public. Craigowan Lodge is a seven-bedroom stone house approximately a mile from the main castle in Balmoral. More rustic than the castle, the lodge was often the home of Charles and Diana when they visited. Currently, it is used as quarters for important guests. In the obituary of Michael Andreevich Romanoff, the highest-ranking member of the Russian imperial family at the time of his death in 2008, it was noted that his family spent most of World War II at Craigowan Lodge. The lodge has been in the news periodically since 2005, because Queen Elizabeth II often spends the first few days of her summer holiday there. During each weekend of the summer the castle is a lucrative source of income from visiting tourists. Sometimes, the Queen arrives at Balmoral before the tourist visiting season is over. Queen Elizabeth II was in residence at Balmoral at the time of the death of Diana, Princess of Wales in 1997. Her private discussions with then Prime Minister, Tony Blair, were dramatised in the Stephen Frears film, The Queen (2006). The 1997 film Mrs Brown also was based on events at Balmoral. In both films, however, substitute locations were used: Blairquhan Castle in The Queen; and Duns Castle in Mrs Brown. Queen Elizabeth II's visits to Balmoral Castle were also featured in several episodes of the Netflix series The Crown. Ardverikie House was used as a stand-in for the royal estate for filming purposes. Since 1987 an illustration of the castle has been featured on the reverse side of £100 notes issued by the Royal Bank of Scotland. ^ Historic Environment Scotland. "BALMORAL CASTLE WITH PARTERRE AND TERRACE WALLS (Category A) (LB51460)". Retrieved 6 March 2019. ^ "Balmoral Castle, Aberdeenshire". www.whichcastle.com. Retrieved 4 December 2010. ^ a b c d e f g h i j Historic Environment Scotland. "BALMORAL CASTLE (GDL00045)". Retrieved 6 March 2019. ^ a b Gordon, Seton (2009). "The Country of Balmoral". Seton Gordon's Cairngorms : an anthology. Whittles. pp. 141–142. ISBN 978-1-904445-88-3. ^ a b c d e f g h i j k l m n o p q MacLean, Charles. Balmoral Highland Estate. Balmoral Castle and Estate. ^ Bellhouse, David (2000). "E.T. Bellhouse and Co. Engineers and Iron Founders" (PDF). David Bellhouse and Sons, Manchester. Retrieved 23 January 2012. ^ "William Smith II". Dictionary of Scottish Architects 1840–1980. Retrieved 23 January 2012. ^ Little, G. A. (1981). Scotland's Gardens. Spur Books. ISBN 0-7157-2091-0. ^ a b Glendinning, Miles; MacKechnie, Aonghus; MacInnes, Ranald (1996). A History of Scottish Architecture. Edinburgh University Press. p. 270. ISBN 0-7486-0849-4. ^ a b Fenwick, Hubert (1974). Scotland's Historic Buildings. Robert Hale. ISBN 0-7091-4497-0. ^ Devine, T.M. (2006). The Scottish Nation 1700–2000. Penguin. ISBN 978-0-14-102769-2. ^ Lynch, Michael (1992). Scotland: A New History. Pimlico. ISBN 978-0-7126-9893-1. ^ Castleden, Rodney (19 August 2014). The Castles of Britain and Ireland. Quercus. ISBN 978-1-62365-543-3. ^ Jones, Nigel R. (2005). Architecture of England, Scotland, and Wales. Greenwood Publishing Group. ISBN 978-0-313-31850-4. ^ a b Wightman, Andy (2011). The Poor Had No Lawyers. Edinburgh: Birlinn. p. 113. ^ "Sandringham House: History". The official website of The British Monarchy. The Royal Household. Archived from the original on 16 April 2010. Retrieved 12 June 2016. ^ a b "Conservation". Balmoral Estates (archived at web.archive.org. Archived from the original on 5 August 2012. Retrieved 18 June 2014. ^ "The Old Man of Lochnagar, 1980". Royal Collection Trust. Inventory no. 1101076. ^ "The Queen buys grouse moor near Balmoral." The Times, London, 6 Jan. 1978: pg 3. ^ "Lochnagar SPA: Standard Data Form" (PDF). Joint Nature Conservation Committee. ^ "Ballolchbuie SPA: Standard Data Form" (PDF). Joint Nature Conservation Committee. ^ "Ballolchbuie SAC: Site Details". Joint Nature Conservation Committee. ^ "Employment". Balmoral Estates archived at web.archive.org. Archived from the original on 15 January 2013. Retrieved 18 June 2014. ^ "Birkhall". The Prince of Wales official website. Household of HRH The Prince of Wales. Retrieved 23 January 2012. ^ a b "Castle siege by tourists keeps Queen at bay". Daily Mail. 2 August 2005. ^ "Current Availability". Balmoral Estates. Retrieved 23 January 2012. ^ "2011 Admission Charges". Balmoral Estate. Retrieved 23 January 2012. ^ a b Michael MacLeod. "Royals in Scotland: Palaces, paparazzi and garden parties". STV News. ^ Gossip, Shona (28 July 2014). "Queen arrives in Royal Deeside for holiday". Press and Journal. Retrieved 31 July 2018. ^ "Michael Andreevich Romanoff: member of the Russian imperial family". The Times. London. 11 October 2008. ^ Brocklebank, Jonathan (2 August 2005). "Castle siege by tourists keeps Queen at bay". Daily Mail. London. ^ "Filming locations for The Queen". Internet Movie Database. Retrieved 23 January 2012. ^ "Filming locations for Mrs Brown". Internet Movie Database. Retrieved 23 January 2012. ^ "8 spectacular filming locations from The Crown to visit as season 2 returns". The Telegraph. Retrieved 5 January 2018. ^ "Current Banknotes : Royal Bank of Scotland". The Committee of Scottish Clearing Bankers. Archived from the original on 3 October 2008. Retrieved 17 October 2008. Millar, Delia (1985). Queen Victoriaʼs life in the Scottish Highlands : depicted by her watercolour artists. London: Philip Wilson. ISBN 0-85667-194-0. Wikimedia Commons has media related to Balmoral Castle. "Balmoral Castle" . Encyclopædia Britannica. 3 (11th ed.). 1911.